If you own, or wish to own, a Flxible bus or motorhome conversion – or just have a special interest in these lovely old buses, you may want to join Flxible Owner’s International. 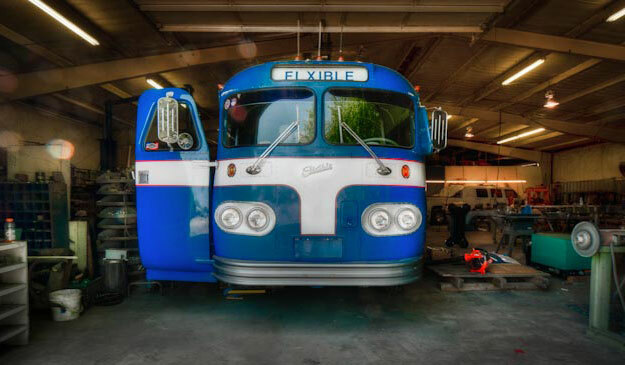 We are an association of Flxible owners and enthusiasts having one thing in common – the will to see as many of the lovely Flxible buses as possible continue to run through the 21st Century. Our members collect, restore, and use these great old vehicles for display and travel – mostly as motorhome conversions, but also as collector pieces – fully seated buses in their original condition. New members are welcome, whether they presently own a Flxible bus or not, regardless of whether it is a seated collector item, or converted for use as a motor home. Full voting memberships go to present owners of Flxible coaches; associate memberships to interested parties who are not presently owners. Dues for members of either category are $40.00 bi-annually – payable at the time of the odd-year Loudonville rally, and prorated from then to the next one. The organization has a number of regular rallies, the foremost being held on even-numbered years at Loudonville, OH, USA – the home of the original Flxible Plant for over half a century. There is also a yearly rally held in Arizona, in the Quartzite area. A published newsletter is mailed to all members four to six times a year. It contains various articles on history, care, and maintenance of Flxible buses, as well as a buy-and-sell section which gives access to and from the many members who are not otherwise connected via the internet through this web site and the forums. It is not only entertaining, but is a valuable resource for anyone looking for a Flxible bus or parts. The Flxible owners of FOI may vote for the organization’s officer’s at the bi-annual rally in Loudonville, Ohio. Join Flxible Owners International Now!